This topic has 573 replies, 13 voices, and was last updated 1 week ago by Nobeerinthefridge. only been up Ben Nevis once but we took the path up via the CIC Hut which culminated in a fair scramble to the summit. 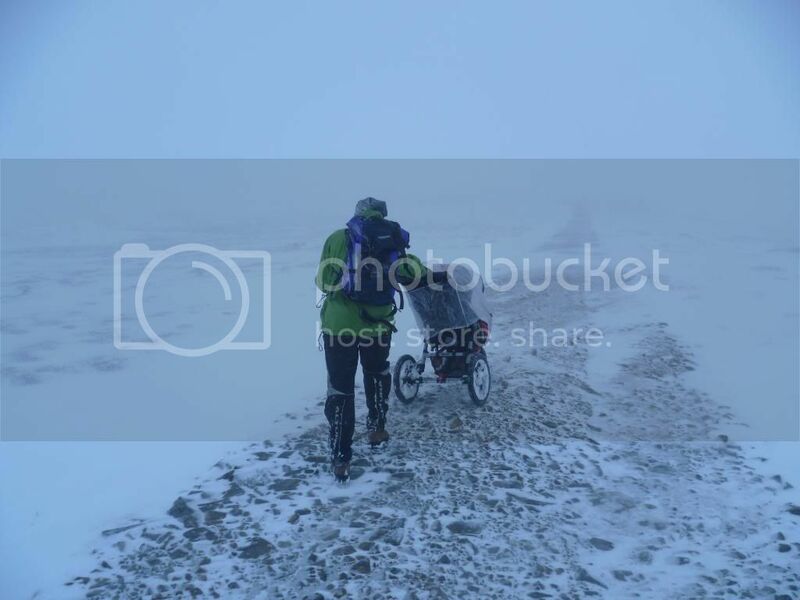 not sure how much of that would be ridable but we had low vis and some snow up there so not the best conditions to scope therefore might have missed something. Ace thread. Some top routes and ideas. Gets me thinking for days and evenings out from Inverness come the spring. agreed – love it! it’s exactly the type of riding i love & very inspiring. it spurred me to organise the trip last october (see pg 2) which i have just re-booked for spring. hopefully we’ll get some good weather this time round! Feel free to contact me nearer the time and I may be able to help with route choice on some of the hills local to me and further afield which I have ridden. Ben Lui is a defite goer from all the research I’ve done on it and from having camped on it some years ago. Boggy at the bottom but gets better the higher you get if memory serves. Has anyone ridden off road from Langdale over to Keswick? 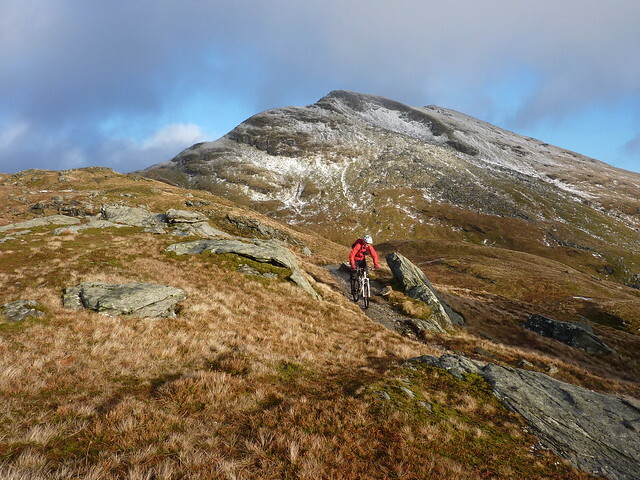 It can be done all on Bridleway with a last cheeky route from Honister Pass summit to round the ride off. Has anyone tried The Cobbler, Ben Ime and Ben Narnain as a lollipop looped day ride? I’m also wondering about the munros behind Beinn Dorain heading north? Ralph Storer’s Munros book hints at possibilities. Stob Ghabar – has anyone done the ridge walk with two summits? I was looking at Walk Highlands and it looks mint. Clear, obvious path with potentially great views on the right day. Pics would be nice if you have them. Great thread! Sbz, Sgurr a Mhaidaidh is rideable up to about 3/4 of the way up the coire from Glen Brittle YH. It gets too rocky after that, you certainly wouldnt want to take a bike up on the ridge. 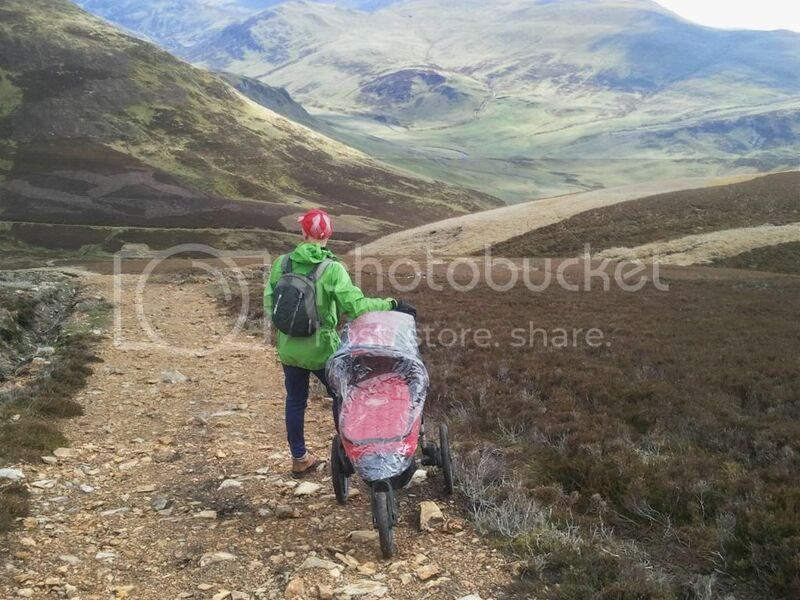 If you wanted to do the two munros leave the bike at the base of an Dorus and walk up. If you were to add Sgurr na Banachdich like i did you will either have to return over the arete (very thin) or dump your bike at the junction further down the coire on the way up to an Dorus. The most recent munros i have done by bike were the two at Loch Lochy, Meall na Teanga and Sron a Choir Gairbh. Meall na Teanga isn’t worth doing and Sron a Choir Gairbh is only just worth doing, however, the Cam Bealach is one of the best descents i have done. Very bouldery and rocky all the way from the top of the bealach to the forest with only a few smoothish bits. I cant recall any waterbars on the way down. Not too sure about riding up the Bealach as i prefer to walk up the munros and ride down, so it was a push up for me (no granny ring). Im sure it would be no bother to the fit and willing. Not sure about that one sanny. Mind you when I walked it I didn’t know much about biking. The ridge named Aonach Eagach on Stob Ghabar is pretty rough. Sgurr Mhaoraich to Am Bathaich in Glencoich forest. Bit of a pull up, but there is a nifty zig – zag singletrack down the face of Am Bathaich to the environs of Altbeithe house. As for Ben Wyvis, its a classic in these here parts, just avoid weekends as everyman an his dog goes up it. Ban More on Mull. That looks pretty straigtht forward. Liking the idea of heading up to the CIC hut on Nevis then heading accross to the tourist path then going back the same way. That’s now added to the list. Meall nan Tarmachan appeals too. It would be a bit on offy with the scramble step down but again it appeals. A straight out and back could be good having walked it in winter a couple of years ago. Has anyone got the beta on the hills along the A9 around Drumochter? What about getting up onto the likes of Ben Alder and also the Mondaliath Mountains? It’s not an area I know well. For Coniston Old Man, I’d be tempted to head up Walna Scar from the Broughton Fells side then on reaching the high point cut up on the track the heads west / north west ish to make a circuit. Has anyone tried this? Also, what about mountains that aren’t munros but which offer fun descents? which paths do you mean?? ridden up the path from stephenson’s ground by the side of the stream – quite a nice climb but gets quite sloppy when it flattens off near the top before you reach walna scar rd. also had a look push up and ridden back down this path, which cuts up to Dow Crag. seem to remember that being ok to ride both ways and it looks like it leads on to the top of old man. i want to check out the area over towards Swirl How & Wetherlam though this year – has anyone ridden or walked up there?? I have walked most of the Munros in the Drumochter area and don’t really remember seeing any singletrack, to be fair they are not the most fun of hills to walk. They do have some landrover track up them and over the last year or two the estate owner has been putting in a lot of new tracks both for landrover and to enable shooting parties easier access. I don’t think any of the singletrack paths go right to the tops of the hills but some look like they could be fun. I did the loop round the bottom of Ben Alder last weekend which was good fun and had some nice bits of singletrack, I didn’t see any paths heading up to the summits so not sure if it would be worth heading up. The bike into the base is 10miles along on good landrover track and doesn’t take long if you have never done the loop it’s worth doing and on really has one hike a bike section but that doesn’t take long. If you are looking for a fun day out that is still in the hills but not Munros you can’t go wrong with a tour round the hillis of Bennachie just to the west of Inverurie. Depending on the loop you do you can get in 6 very good long decents all very good and with very little hike a bike. Glas Tulaichan can be made into a three summit round trip. When I do it, I’ll post on here as it has great potential when the weather is nice. It all depends. Often maps aren’t always up to date and don’t always reflect what is on the ground. For example, Carn a Chlamain has a Land Rover track to just below the summit but you wouldn’t know from the OS Map I have. Wlak Highlands is a great site as is geograph for pictures of trails and getting the beta on potential routes. You’ll be the man for Torridon. What scope is there for the peaks up there beyond what we did when we were last up there? Also, has anyone ridden anything on the west side of Glencoe? Not a munro but what would Goat Fell be like? I’ve had it as a possible for a while but yet to try it. I’m thinking carry at the top? Sanny – long time no see. Anyway – as said before Mt Keen from either side. Including it in the Fungle loop makes a fantastic day out. Broad Cairn also goes, combined with Corrie Chash is ok, but I think a better option would be descent to Bachnagairn which would be wonderfully tech. Goat Fell’s a ride-n-push to the top and a fun descent which always feels a bit shorter than you’d hoped. Like Lomond, its seldom quiet, so you need to choose your time (obv easier if you’re staying on Arran). I did it again over Christmas in horrific weather, sacked the last bit of climbing because the wind was just too strong and was happy just to get down! I’ve walked the Stob Ghabhar loop (from the uni hut and back) years ago – I think that would be an interesting day, but from memory there are some narrow ridge sections and a steep bit of scree along the way so it would be a bit stop-start. A good one for taking the train to though. Hi – love this thread, defo the best sort of riding you can do IMO. Feel free to shout me down but………. I am in the process of developing a route guide and would love to get some of these mapped on my website site (you should be able to figure out the url) on the routes page. Be ace to get with a brief description, some photos then the route mapped on an OS map (I could do this) what do you think? Obviously I would benefit from additional content but wouldn’t profit from it directly. Good, point well made! If only we could password protect them…..
I’ve never bothered trying to ride the top but the two routes are rideable from the shoulder of Meall Breac. The main tourist path is rideable up to about 350m and mostly a push afterwards. The descent is better on the main tourist route but if you like super techy rocky steps then the descent to corrie is the one. I like it as I like the trials stuff but its not to most peoples taste. I’m champing at the bit reading this thread and looking at these pics. Here’s the Five sisters from the other side of glenshiel. I sure am. The club has moved away from epics a bit but there are a few of us still mad for damn fool adventures. Out of interest, has anyone gone up Beinn Fhada? Roll on April indeed though with a bit of luck, we should get some good settled days before then to get up high. Bedmaker. Ace pics fella. What route did you take when you took that pic? a couple of sections needed looking at first though to get the correct lines. The best way i’ve “ridden” Goat Fell by bike is to loop round it; roadie it from Brodick pier to Sannox (good warm-up), ride SW along Glen Sannox to hike-a-bike/scramble up onto the Saddle (steep chimney with good handholds! ), enjoy Glen Rosa singletrack descent back to Brodick in time for the ferry/Arran Blonde. Not as much people-traffic as the up-and-back Goat Fell path. The route when I took that pic has a fair bit of road in it but makes for a nice few hours out. From shiel bridge, pump the tyres up hard and head up over the bealach ratagan to Glenelg. Stop for a pint. Carry on past Glenelg, pass the brochs at Glen beag then the off road starts at Balvraid. Follow the track to the bothy at Suardalan, head down the hillside to the bridge below the bothy. Cross the river and head for the ruin at bealachasan then hike a bike up allt a ghleannain. The path back down to shiel is lovely then, nice and rocky. Pic taken at lloch coire nan crogachan looking across to the sisters. A shorter version is to go to the top of the bealach then take the forestry track (NG895199)down to bealachasan, bypassing Gleneg and Glen beag. So Ptarmigan off Ben Lomond. Rode it with my mate Marky Mark this weekend and it is a bit of a belter. January is perhaps not the ideal time for such things but we got lucky with the weather. It’s something of a full on tech fest. There’s no point at which you can let go of the brakes and just flow. Tight, rutted switchbacks, rocky stone pitching and exposed bedrock make for a lot of slow speed fun. The very top section is a scrambly carry down but then things become a lot more interesting. We had high winds and a bit of ice / wet slippy rock to contend with at the top so some of the stuff that we would normally ride got the “let’s leave it for the Spring” to come back on a dry and still day treatment. No point in being a hero as an off had the potential to be really consequential. Seeing one of the Sea Kings from HMS Gannet below us encouraged the sensible hat to be worn. As we descended, the trail just got better and better and didn’t let up until we hit the trail at the shore. Would I do it again? Absolutely and we’re already planning a return trip. Is it better than the main tourist path? Hard to say. If you like tech, it’s a peach but the tech is at the expense of high speed flow so you pay your money and take your choice. Ptarmigan is a bit steep, well done! Did the conventional route last year in foul weather but it was still jam packed with tourists. Only managed 7 munros last year as I was late to the Munro biking party. A few of the Corbetts are good too and shouldn’t be overlooked. The Cobbler is decent. Not a Munro but if you must tick boxes there’s Narnain and Ime next to it. We gave Ime a go while we were up there but it was crap – far too boggy. The top section from the Cobbler down to the gravel path is great fun though. Nice and rocky. Link to pics from the trip up and down Ben Lomond on the lesser travelled Ptarmigan Path. Marvellous! nice one Sanny – looks good that path, think I’ll have a crack at it when we go up in May. i was expecting it to be a bit more boggy than that, but looks like a fairly substantial path. It’s definitely not a boggy path! There is a lot of stone pitching on it but it doesn’t detract from the ride. The carry down the top section would be a wee bit tricky if you came via the tourist path. Been looking at Beinn Dhorainn again. Up the main path to the bealach, knock out the two adjacent summits then drop down and head north along the next two munros to the corrie above the lochan looks like a dictinct possibility. It would be possible to do all five munros but I reckon the hike to bike ratio might be a bit too much. What Corbetts would you recommend? PS Gratuitous munro biking shot below. Ben Gulabin at Spittal of Glenshee, Monomanach bit further East, Cairn Freachadein at Kingussie & Leathad an Taobhain in Glen Feshie. Have you walked or ridden any of them? What were they like if you have? Yes I’ve pushed a pram to the top of both Gulabin & Freachadein. I could ride up both of them in the right conditions, track all the way to the top. Walked Monomanach, track up to about half way then a grassy singletrack to summit. Leathad has the Minigaig pass going over it near to summit. Also Carn Ealasaid near Lecht Ski slopes would easily go.